This is my entry for this week's Wednesday Sketch Challenge over at The Outlawz. I loved the color challenge this week so much, that I decided to use the same colors for my sketch challenge. This card was cut using my Silhouette Cameo and a cut file from Silhouette's online store. This is called a corner pocket card. The heart gives the appearance of 3 layers, but is actually cut along with the card and folded up. I then took the 2 middle hearts and removed the rest of the cut and recut those with tan and white card stock to add dimension and color. I mounted 3 strips of tan card stock on white card stock and then added rub-ons from Stampin' Up! The rub-ons were originally horizontal, so I cut each letter separately, so I could get the vertical greeting and the x's and o's. Each piece was very small, so I figured out quickly that a piece of removal tape would hold the piece in place while I burnished it. That worked out perfectly. I also placed a strip of white card stock, embossed with Swiss dots and mounted on tan card stock underneath the 3 strips. I also put a rub-on sentiment on the curve of the heart. It's hard to read, but it says "With All My Heart." I added a resin flourish on the left side, a clear heart gem in the center of the heart pocket, and a round clear gem in the dip of the heart pocket. I used 3 pearl hearts on the strips and a clear round gem between the x's and o's. How cute! I love how you altered those rub-ons to fit your sketch! Thanks for playing along with the Friends of Speedy TV! 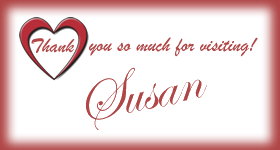 Great card, Susan! You should enter it in our challenge at Great Impressions Stamps! Love your last card too - beautifully done!!! Popped over from Cuddlebug Cuties blog hop. Beautiful card. Cute n lovely card Susan. Love the colors used. Thank u for visiting my blog n leaving wonderful comments. Happy to follow u back. This card is very simple and elegant!! I get so excited when I see your name come up on my comments on my blog! Your so kind and honest and I love that about you! Thanks for the input! Okay, onto your talented self.....This card is wonderful! That lace heart in the corner is fabulous...I was bummed when I realized it was from your silhouette ....don't have one of those yet! Also, cutting those rub ons by hand was a lot of work, but it looks great Vertical! All in all a wonderful card! Thanks again for making my night! This is so pretty (in pink)...LOL Okay, you know I couldn't resist that remark! Kraft card stock simply goes with everything it seems. Is Kraft the "new black"? Just asking... This card is fab, with all the details. If the sentiment was horizontal...I would have just left it alone, but you cut it out to make it work vertically? Such dedication! That's the artist in you...amazing attention to details! Admire that! This is beautiful. Love the layout and when I read you fussy cut the rub-ons-time consuming but the end result is great. Hope it went to someone special. Thanks for playing along with us at Great Impressions Stamps February “heart challenge”.